Having wanted to get involved in California politics since watching the 2008 revelry from the sidelines, I made it my mission to join the Brown campaign’s roster of part-time volunteers. So I stopped by the Oakland headquarters one morning in early summer to drop off my resume. By the end of the day, I had quit my job and fully committed myself to spending the next five months getting Jerry elected. Last night, surrounded by coworkers, volunteers, loyal politicos, friends, and fans at Oakland’s Fox Theater, I watched in awe as my efforts came to fruition. 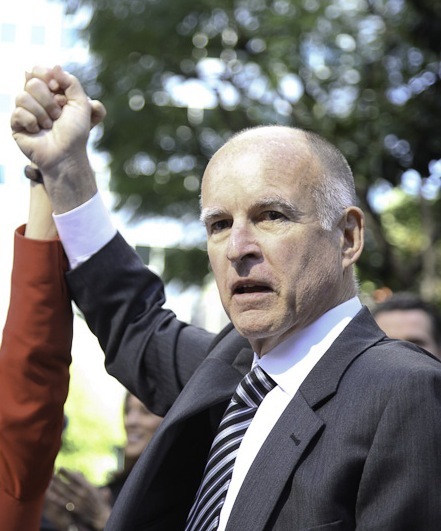 Jerry Brown, 54; Meg Whitman, 41. Californians had officially chosen their next Governor. It was a feat only a man as authentic and eccentric as Jerry could pull off. At odds with the most expensive non-presidential campaign and largest self-funded candidate in our nation’s history, our scrappy office of thirty-some (mostly unpaid) staffers battled a behemoth advertising blitz that began the day Whitman seized the Republican primary and didn’t cease until yesterday. All the while, Jerry remained in good spirits, relentlessly crisscrossing California as he spread his message, peppering his speeches with those quirky asides his supporters know and love (“I’m the best pension deal our state can buy!”), reassuring voters they had the option to choose a human candidate and not just a product of a corporate campaign consultancy. I’m confident Jerry will lead our state towards a brighter future--after all, it takes both a solid vision and years of experience to navigate the complex labyrinth of Sacramento politics. There’s no disputing his experience. The son of California hall-of-famer and beloved former Governor Pat Brown, Jerry has been breathing state politics since he was five years old. His resume runs the gamut of elected offices: Secretary of State (1971-1975), two terms as Governor (1975-1983), chairman of the California Democratic Party (1989-1991), Mayor of Oakland (1999-2007), and Attorney General, a position he’s held since 2007. In between, he traveled the world, broadening his experience and deepening his knowledge. The former Jesuit Seminary pupil studied under leading Zen practitioners in Japan and ministered to the sick at one of Mother Theresa’s hospices in India. Throughout his four-decade career as a public servant, Jerry has championed progressive policies, from pioneering environmental laws to landmark legislation protecting equal rights. As Governor, he created 1.9 million new jobs and selected more women and minorities for his cabinet than ever before, including the first woman and first Latino to be appointed to the state Supreme Court. And his vision is equally inspiring. My personal political philosophies lead me to believe in the importance of the three e’s: education, the economy, and the environment. Jerry has presented comprehensive plans for all three, including a groundbreaking clean energy proposal slated to create hundreds of thousands of jobs in the sector. These past five months have been an amazing adventure, complete with early mornings, late nights, media firestorms, and tireless conversations with angry and enthusiastic voters alike. I’m proud of my team for guiding Jerry towards victory, but I’m even more proud of my fellow Californians for making the right choice on Election Day.